The number 18 seed, Elina Svitolina faces one of the long list of impressive qualifiers, Sorana Cirstea in the first round of the 2016 French Open. It’s been a while since I can remember such a strong list of qualifiers on the women’s side with quite a few players having experienced excellent clay court seasons… One of those players is Sorana Cirstea. The 26-year-old has been plagued with shoulder problems for the past two years, so much so, that she now has an abbreviated service motion to try and protect the shoulder. Fully fit again, Cirstea has been enjoying a return to form in 2016. Cirstea has won 31 (!) singles matches in 2016. With her subdued ranking, Cirstea began the year on the ITF tour on clay and had great success, reaching back-to-back finals in Guaruja and Bertioga, and winning the latter. The most impressive aspect of her year has been the jump-up to the WTA tour again, which has been smooth. Cirstea reached the semi-finals of Rio and then successfully qualified for three WTA tournaments in Istanbul, Prague and Madrid. In Madrid, where she benefited from a wildcard, Cirstea had a wonderful week picking up wins over Jelena Jankovic (6-4 6-3), Danka Kovinic (6-3 7-5) and Laura Siegemund (6-4 7-6) before pushing the eventual finalist, Dominika Cibulkova to three sets. I’ve enjoyed watching Cirstea this year and something feels different. In the past, she has often been labelled as a ballbasher but she seems much more measured and controlled in her play. It would seem that the break from the tour has actually been favourable for her in terms of figuring how tactics and how she wants to play. Cirstea has just cracked the world’s top 100 but still needed to qualify for the French Open (as the cut-off for singles is about six weeks prior to the tournament). The Romanian player could have felt the pressure to perform having played so well of late but she breezed through qualifying with victories over Yuxuan Zhang (6-4 6-0), Jana Cepelova (6-2 6-4) and Elise Mertens (6-3 6-0). Cirstea faces Svitolina in the first round who has not been enjoying such a fruitful clay court season. The 21-year-old has won just one match on clay this year in Madrid and has experienced losses to Alexandra Panova (5-7 6-1 6-7, Bogota), Daria Gavrilova (2-6 6-7, Madrid) and Monica Puig (1-6 6-4 1-6). 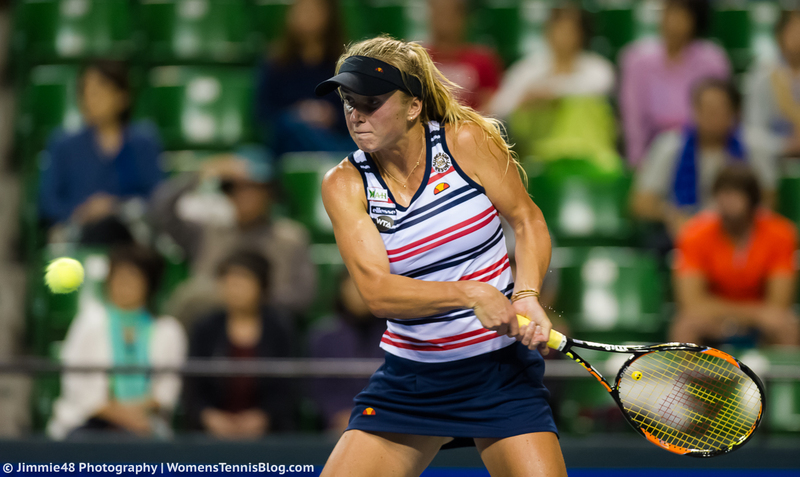 From the matches i’ve seen, Svitolina seems to be stuck in the middle of trying to be more aggressive yet still retaining the counter-punching qualities that have helped her to crack the world’s top 20. In her match against Gavrilova in Madrid, Svitolina was trying to come forward more but she did not look comfortable at the net. Head-to-head record: Svitolina and Cirstea will be playing each other for the first time on the WTA tour. May 22, 2016 in Cirstea, Roland Garros, Svitolina, WTA. Svitolina’s year has really fallen apart. Henin doesn’t seem to have added anything to her game really… I still wish she’d play more doubles and let her net game develop that way rather than forcing her to come in during singles matches. I don’t know what’s happened to Elina or her game. I remember that last year she was capable of giving Serena a run for her money (although she lost that match). I believe that there’s a ceiling to the way that Svitolina has been playing. She’s a solid top 20 player but to take her game to the next level, she has to be more aggressive and take more chances. I can see signs of Elina doing this but it’s not going to be easy! I always found the Svitolina-Henin partnership to be a strange one! I just think that trying to push someone to come into the net mid season is risky business. Unsuccessful attempts will do nothing for her confidence. Playing doubles is a proven method of improving net play. Look at Muguruza and Garcia, neither looked nearly as solid coming in until they put the time in playing doubles. Well we don’t know what their tactics have been but it looked like in her match against Gavrilova in Madrid that she was trying to come forward more. I didn’t get to see much of the Puig match in Rome though. Neither did I but I do love Puig and think she could be a great talent in the years to come.